Best known for its videos, YouTube has become one of the largest providers of streaming music right alongside services like Spotify and Apple Music. Now, YouTube has taken the listening experience up a notch with a new app designed to make music discovery more convenient — and paired with YouTube Red, the company's subscription music app, it provides the kind of features you'd expect from premium music streaming services. The free YouTube Music app offers the kind of robust playback and search features commonly expected from dedicated music streaming services. The YouTube Music app is free and ad-supported, but you can amplify your experience by subscribing to YouTube Red, which removes advertising and allows you to listen to music offline, restrict playback to audio only and play media in the background. YouTube's huge collection of licensed audio tracks numbers about 30 million, roughly the same as major competitors but with an important difference: more audio options that no other music services currently offer. On YouTube, you can find live concert videos, karaoke music with embedded lyrics and instructional videos about specific subjects. Unlike services like Google Play Music, YouTube Music doesn't allow you create playlists. Instead, it focuses on doing the work for you by creating a daily My Mix list that includes tracks that you’ve listened to, tracks you’ve liked and other tracks that it thinks you might be interested in. This feature improves if you subscribe to YouTube Red so that you can save your playlist tracks for offline playback. The app can analyze your music taste to suggest playlists drawn from specific genres. Browse tracks by artists through their respective pages, where you can listen to an artist’s full album. If the artist’s tracks include videos, those will be played. With a YouTube Red subscription, you can play the audio in the background, or save bandwidth and battery power by choosing to play only the audio (instead of both audio and video). At times when you’re in a play-what-may mood, embark on a musical journey beginning with a favorite artist’s track and leading to a never ending playlist of tracks from closely related artists or random picks from a variety of artists. “The music will never stop,” wrote T. Jay Fowler, YouTube’s director of product management. YouTube Music also includes a tab for trending music on YouTube, which features not only the tracks currently popular on YouTube but also rising and lesser-known artists that YouTube curators think will soar in the future. 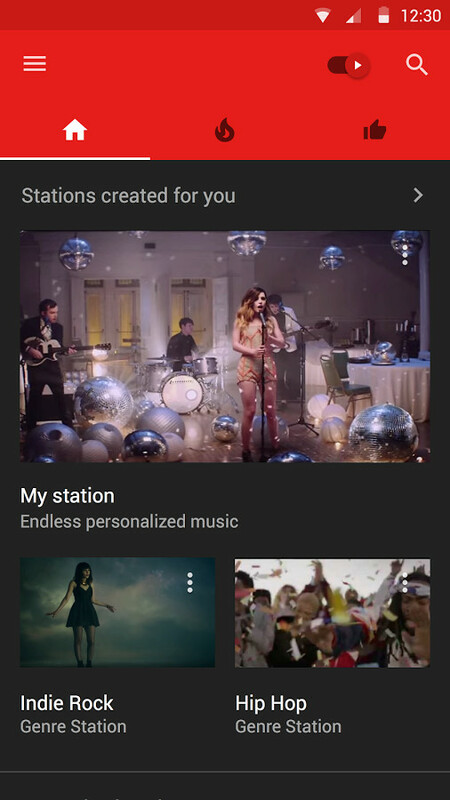 YouTube Music for Android is now available on the Google Play Store or the App Store for iOS. For now, when you install YouTube Music, you get a free 14-day trial of YouTube Red.